Who Were the Ancient Mountain Dwellers of Coastal El Salvador? Between the years 950 and 1200 A.D. massive migrations of Nahuatl speaking people reached the western shores of the Pacific coast of El Salvador. They inhabited the very jagged Balsamo mountain range. Photo by Fabio Esteban Amador. It’s difficult to recognize and understand the meaning of ancient texts, words, symbols and the messages they contain. This is not only due to the very complexity of systems of communication, but mostly because we often don’t see them. During the holidays, I had the opportunity to go to the field with Marlon Escamilla, a Salvadoran archaeologist and Ph.D. candidate from Vanderbilt University, who’s thesis focuses on the archaeology of the people who inhabited the Balsamo Mountain Range in coastal western El Salvador. While Escamilla focuses mostly on the Pre-Columbian structures that were built on the very ridges of the jagged mountain tops, the valleys and small canyons may hold clues to the very nature of the people who once lived in this region. Can You Find the Symbols on the Rock Surface? Ancient writing systems vary from simple ideographs to complex iconography. Finding these symbols requires looking at rocks as canvases used by time travelers. I consider them time travelers, because although the artists have been dead for centuries if not thousands of years, their messages remain on the rock surface. A second level of complexity is understanding the meaning of these fragmented “texts”, and this is limited by the information we have on the culture that created them. In many cases there is a historical break, the loss of a language or the vanishing of a people and their traditions, which limits us from knowing. We are certain, however, that people dedicated time, effort and energy in developing symbols that conveyed their thoughts and experiences on earth, these symbols on the rocks are signposts to their world. FE: why do you think people decided to live on such high mountain ridges? Marlon: Perhaps one of the reasons is related with a defensive necessity, they were looking for places that allowed them to have visual control of the landscape. But at the same time, maybe these ancient groups decided to live on this particular landscape because there was a symbolic implication as well, one that allowed them to practice their rituals on the top of the mountains. Citizen Science – Collaborating to our Knowledge. During our visit to one particular site in a canyon, we had the opportunity to take photos with a Gigapan Epic Pro robot, which allowed us to create large stitched images, zoom in and out and explore the rock face without loosing detail. See if you can discover the many symbols on the rock surface. You have probably been able to discover various symbols. Archaeologists use systematic recording methods in order to make sense of what is left of this human record. The site where the images were found is quite large and it took three stitched panels to capture the entire surface. You have also probably noted that the symbols have been painted in Red, White and Pink. This was not our doing, but rather some visitor who thought that painting them would make them more visible, but the fact is that the best way to preserve this fragile record is “not to touch it”. Perhaps you can make a list of all the symbols visible on the rock. If you do, point to their location and then use a simple tracing/drawing program to copy image. Leave comments below and I will follow up with the names of the contributors in a future blog. FE: Is there a connection between the rock art found on the canyons and valleys of the mountain range? Marlon: I think yes. Although we cannot read the petroglyphs, at least at this moment, there is a carved figure depicting Tlaloc (principal rain god), one of the main deities of the Nahua-Pipil groups during the Postclassic period (850 – 1524 AD). 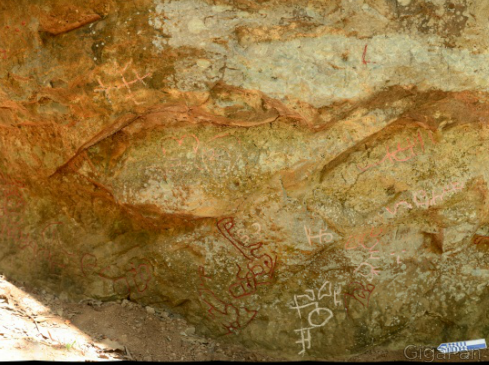 During this period, the Nahua-Pipil groups were living on the mountain ridges and Tlaloc veneration was a very common ritual, usually practiced at hilltop places and next to rivers or lagoons, and the rock art site is located just next to a narrow river. We all have different ways of seeing and that’s why we feel that this method of collaboration is a powerful one. We are interested in creating knowledge for all the citizens of the world. This is humanity’s past, this is their experience, this is their art. This is our heritage. It may be possible to discover something new, make sense of things. I believe in the notion that we create our own identity, and so, your contribution will go directly into the reconstruction of history and cultural identity for this region in Central America. FE: How will your understanding of these ancient inhabitants increase our notions of the past? Marlon: The development of archaeological research in the area will allow understanding about the daily life practices and ancient rituals, how the Nahua-Pipil lived, communicated and understood their world. Also, we can learn about the use and appropriation of space, landscape and other sources. Archaeology is a science that allows us to travel back in time, opening a wide window in order to learn about ancient ways of life and understand the complexity of human behavior. 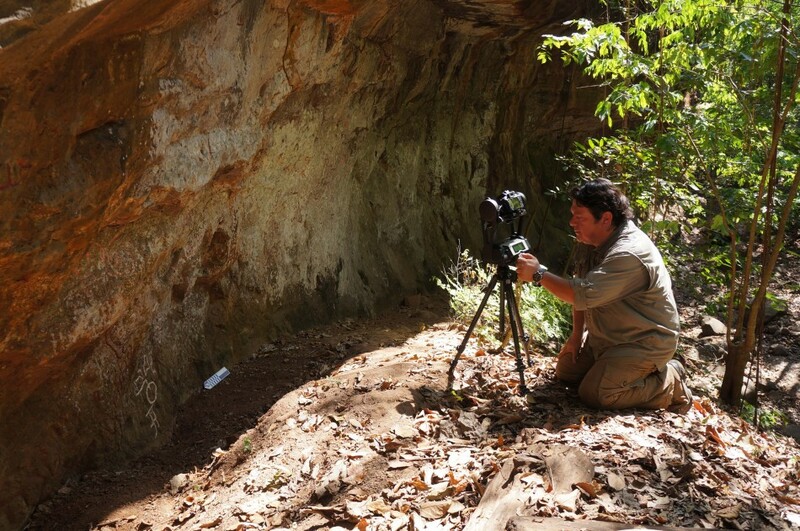 Salvadoran archaeologist, Marlon Escamilla, uses the Epic Pro Gigapan robot to capture complex imagery at the Balsamo mountain range in coastal western El Salvador.. Photo by Fabio Esteban Amador. FE: What is the future of Archaeology for El Salvador? Marlon: I see a very positive future. El Salvador is such a rich country in cultural resources located in both contexts, terrestrial and underwater. In the recent past, archaeology was only practiced by a few foreign archaeologists; nowadays we have an academic program in archaeology at the Universidad Tecnológica (Technological University), and every year the number of students is increasing. At the same time some Salvadoran archaeologists are obtaining higher degrees. Still, there are a lot of things to do, however the archaeology of El Salvador is on the right track, the idea is to develop more archaeological research involving Salvadorans and foreign archaeologist in order to build a solid interpretation about the past. El Salvador is an archaeological treasure where you can explore different cultures, different periods and also you can practice underwater archaeology on Pacific Coast and volcanic lagoons.